It seems like I’ve been struggling with painting sunflowers forever but with each attempt I understand them a little better. I’m very stubborn and will continue trying until the sunflowers and I are really good friends. I lit the flowers above with very warm light which made the olive-green backdrop cloth look gold and kind of bleached out the color of the flowers. The pictures in this post are in the reverse order I made them, with the last first. I did the sketch above after having such difficulty with the two below, trying to better understand the shapes of the flowers and their structure. After working for hours on the vase in the painting above I looked at it in the mirror to check the symmetry and couldn’t stop laughing. It was completely off kilter, slanted to one side as if it had melted. It’s just amazing how our eyes and brain work together to correct things and fool us. I had to completely start the vase over to get it close to right. I experimented with using a dark background and tried to paint duller, darker colors for flowers not in the light but vibrant color kept sneaking back in. After days of repainting I called it done so I could move on. The first problem with the one above was my drawing. 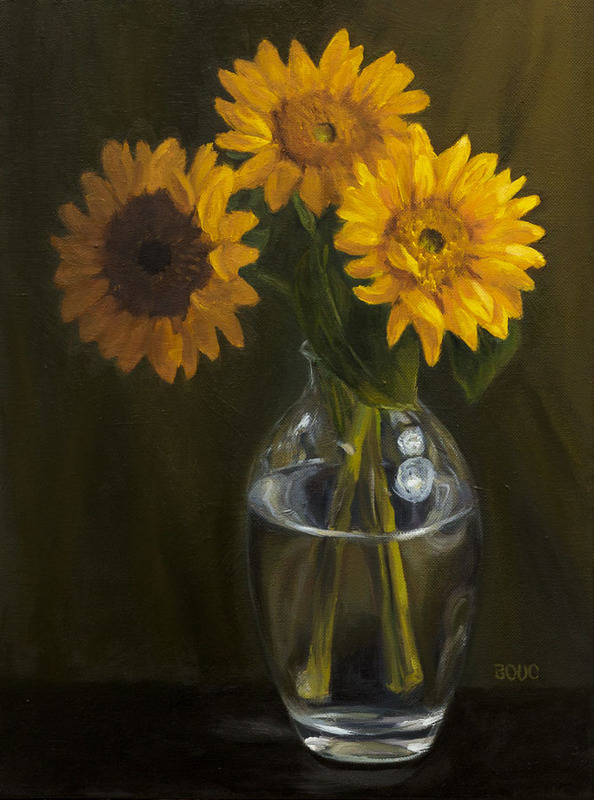 Instead of taking the time to carefully draw these sunflowers I jumped into painting, combining a few specifics with some generic version of flowers. All the pointy, sharp shapes and droopy flowers are a good visual representation of my struggle, frustration, and ultimately, disappointment with this painting. I completed these pieces at the end of last year and had to give up when I couldn’t find any more sunflowers. Soon sunflowers will be available and I can start painting them again. I have a feeling it’s going to go better this time around. I am studying nature drawing with John Muir Laws at his Bay Area Nature Journal Club. This month’s session was all about drawing flowers and I learned all sorts of cool stuff. More about that another time. Thank you for sharing your struggles. The outcome is fabulous! I think you are definitely getting the hang of this! I like them all and it really doesn’t matter that the one is off-kilter — I see it as on-kilter. I love all these manifestations of sunflowers. It’s exciting to see an artist use different mediums and I have to say I’m glad you’re still trying to “master” them. We get to see all these different views of a wondrous flower by an artist with a great eye. I liked the color notes. I’m terrible at color so it’s always good to hear why a color does or doesn’t work for you. Thanks for sharing. It’s flower season! You have been industrious and persistent and they are certainly hard to capture as they just aint the prettiest of flowers anyway, though they look great in a garden in front of a wall rather than in a vase. I didn’t mean to be harsh, but they are such show-offs it might be that you take of in imagination by having some ladybugs or ants crawling on them to keep them disciplined a bit. 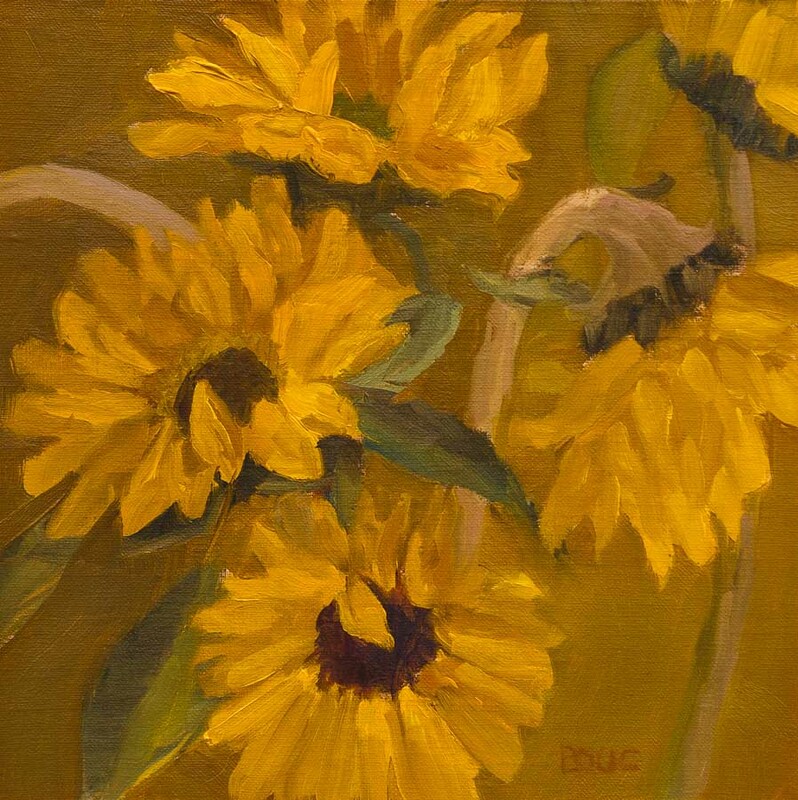 So, I showed your sunflower paintings to my art group yesterday and everyone was very complimentary. They could not believe how multi-talented you are and that you can work so well in more than one medium. I keep popping through the pictures to see the one I like the best. And, I couldn’t choose, because I like them all. I am also very partial to sunflowers. I often buy them to display as cut flowers in my house. Lovely work! I think you’re being hard on yourself. 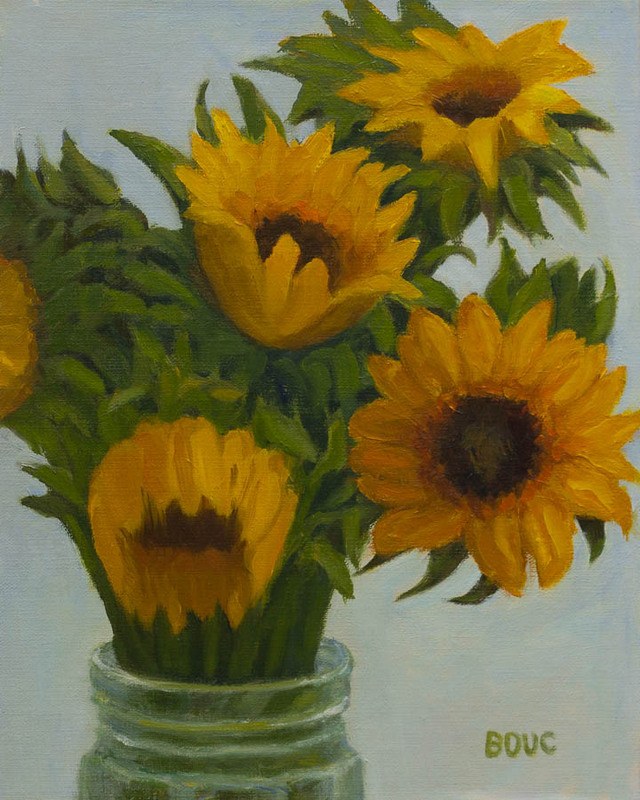 I look and see beautiful sunflower paintings. You should too. Although there’s nothing wrong with continuing to perfect your work. If I could paint half as well as you do, I would be thrilled. My name is Roxy Rodriguez, I am a photographer in California, Orange County area! 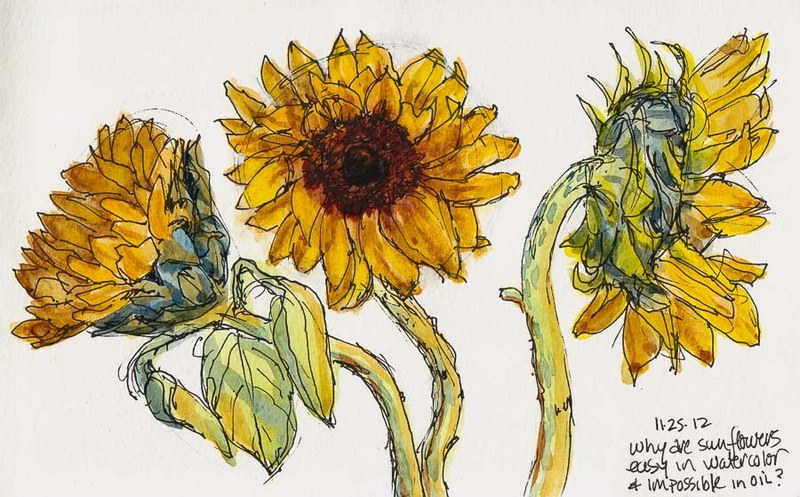 I am absolutely in LOVE with your water color sketch of the sunflowers. I would love to use it as “logo” photo on my website and blog! I understand that a lot goes into gaining permission to do so. Email me photographybyroxy@ymail.com. Thank you for your time!